Stay updated with announcements, find answers to S’well questions, and share your suggestions with us. Q: How does my S’well work? Please see our Care & Caution section for the full scoop on how to use your S’well product safely and effectively! Q: What can I use my S’well product for? Q: Can I put my S’well products in the refrigerator, freezer or microwave? Q: Can I use my S’well products to store drinks and keep them fresh? Your S’well will certainly help your drink stay fresh all day long, but it’s not intended for long-term storage of liquids. Alcohol, some juices, and dairy-based beverages can spoil and may cause excessive pressure buildup in your bottle, which can lead to lid failure and injury. And remember, putting your S’well in the fridge can damage the vacuum seal that helps it maintain ideal temperatures. Q: Can I fly with my S’well? Your S’well is airport security friendly, as long as you remember to empty out what’s inside first. Bon voyage! Q: Will my S’well product sweat? No way! Thanks to S’well’s triple-walled insulation, which includes a copper layer, the outside of your S’well will stay completely condensation-free. Q: What are S’well products made of? S’well products are made of high-quality, 18/8 food-grade stainless steel. This material is highly resistant to rust and does not need a liner. S’well products are certified to meet all regulatory requirements by an independent and accredited testing facility. In addition, we are compliant with California Prop 65 regulations and Title 21 of the FDA Code of Federal Regulations. Your S’well is BPA-free, and provides a sustainable eco-friendly alternative to single-use plastic water bottles. Q: Where are S’well products manufactured? Our bottles and beverage containers are thoughtfully designed in New York City and responsibly made in China. Q: How will my S’well be packaged? As S'well evolves, we continue to find new ways to lessen our environmental footprint. In fact, we launched S'ip by S'well with minimal cardboard packaging and we’ve recently updated (and downsized) our S'well packaging to a slim belly band made of 100% recycled paper. These discreet belly bands contain all the information you'll need about your new product, including care and caution instructions. The band is secured around your S’well with a few glue dots; it should come off with ease. If any residue remains on the product, a little rubbing alcohol (91%) will help it come off without damaging the paint on your bottle. Anything stronger than that may compromise the finish. Be assured that we have taken the necessary steps to ensure that our products are properly protected during shipping and that we will continue to uphold our standards of excellence with this packaging change. Q: What is the approximate size and weight of each S’well product? Q: What is the Sport Collection? Designed to accommodate your active lifestyle, the Sport Collection offers ease and accessibility on-the-go, whether your passion is long runs, high hikes or back bends. Q: What are the different type of caps? Swing Cap: The new Swing Cap is designed with a hinged handle for comfortable, two-fingered carrying. It can also be clipped onto backpacks or bags for hands-free portability. Sport Cap: Our Sport Cap clicks open and closed easily for a one-handed and splash-free drinking experience. No need to pause the treadmill or interrupt a perfect yoga pose to unscrew the cap, simply click it open to hydrate easily. The Sport Cap is intended to be used with cold liquids only. S'ip Adventure Cap: Designed with a convenient pop top, the S'ip Adventure Cap is ideal for on-the-go sipping and storage. The U-shaped stainless steel handle is designed for easy carrying, or clipping onto your bag or backpack for hands-free portability. The S'ip Adventure Cap is intended to be used with cold liquids only. Please Note: The S’well Sport Cap and S’ip Adventure Cap are designed for convenience and ease of drinking; temperature retention may vary to that of the S’well Original Cap which is meant for insulation and storage. Q: Can my Swing or Sport Cap be used on other bottles? Our new Swing and Sports caps were designed to fit most of our S’well bottles. Please note that these caps may not fit some of our bottles. Q: What is the S’well Commuter Lid? The Commuter Lid transforms any size S’well Traveler into the perfect on-the-go beverage container. Designed to sip on during even the most hectic on-the-go moments, the Commuter Lid offers the easiest of access to hydration (or java motivation) when you need it most. The stainless steel lid features a convenient pop top. Simply pop up the tab to drink, and snap it shut to seal again. Coming Holiday 2018. Please Note: The S’well Commuter Lid was designed for convenience and ease of drinking; temperature retention may vary to that of the S’well Original Traveler Lid which is meant for insulation and storage. Q: How should I care for my Commuter Lid? Clean using warm, soapy water. Make sure to dry upside-down. Do not use with carbonated beverages. Q: How do I use my Commuter Lid? For on-the-go sipping, just screw on the lid and use the tab on top to open and close. Be sure you make sure it’s tightly closed before throwing it into your bag! Do not use the sipping tab to twist the lid on and off! Q: Will the Commuter Lid fit on my S’well Traveler? Yes! The Commuter Lid was made to be used on all sizes of our S’well Traveler. Q: What is the S’well Cocktail Kit? With all the hosting and toasting that comes with the holiday season, our new Cocktail Kit makes the perfect gift for your favorite aspiring mixologist, hostess or spirits connoisseur—or festive present to yourself. Measure and mix your drink of choice using our stainless steel jigger and shaker, then serve in our dinner-party-ready Tumblers. Please note the S’well Cocktail Kit was designed for shaking and serving; temperature retention may vary. Q: How do I use the Cocktail Kit? The S'well Cocktail Kit comes with three components: the tumbler, the lid, and the cap. To avoid air pockets you must first remove the cap before placing the lid onto the tumbler. You'll want to shake with care and keep your index finger on cap of the shaker when shaking. This product is not intended for use with carbonated beverages. S’well does not recommend using carbonated beverages with your Cocktail Kit. Q: How many ounces does the Cocktail Kit jigger hold? The jigger holds the standard .75 ounces in its small end and 1.5 ounces in its large end. These measurements are when it is filled to the rim. Q: How should I care for my Cocktail Kit? You can clean all the components of your Cocktail Kit with soapy warm water. Do not place it in the dishwasher. Q: What are the dimensions of S'well's stainless steel straw? S'well's straw is composed of three components: a 6.7" base piece, a curved silicone flexi-neck, and a 2.2" end piece. The complete straw measures approximately 9.4 inches in length with a .24 inch diameter. Q: What are the straws made of? The straws are made of high-grade 18/8 stainless steel and FDA approved food-grade silicone. They are BPA/BPS-free, eco-friendly, and reusable. Q: How do I clean my straw set? First, take the straw pieces apart - use caution when handling small components around small children. Wet the cleaning brush with warm soapy water and then use to clean the interior and exterior of each piece. Rinse thoroughly, and allow to dry completely before reassembly and drinking use. Please clean before initial use. Q: What can I use my straw for? For everyday hydration, of course! The straw fits in the mouth of all our bottles, travelers, and both the Commuter and Tumbler lids.! Pro Tip: You can also use the straw without the end piece and drink directly from the silicone flexi-neck. Caution: Hot liquids can burn user. Not for children under 3 years old. Q: How do I clean my S’well? Q: How do I remove the belly-band from my bottle? The band is secured around your S’well with a few glue dots; it should come off with ease. If any residue remains on the product, a little rubbing alcohol (70-91%) will help it come off without damaging the paint on your bottle. Anything stronger than that may compromise the finish. Q: How do I clean Chalk Pen ink from my bottle? Chalk Ink Pens are a fun way to label and personalize your bottle. The ink won’t rub off on your hand when you take a drink, but can easily be removed with a damp cloth, sponge or a bit of dish cleanser. Chalk Ink pens are safe and toxin free, just like the rest of our products. Q: How do I clean/store/handle my S'well Swarovski bottle? For questions or concerns regarding warranty and cleaning information for our Swarovski bottles, please email help@swellbottle.com. Q: What I should be aware of while using and taking care of my S’well bottle? S’well products should only be used for their intended purposes. Do not place your S’well in the microwave. Do not place your S’well in the freezer. Do not overfill; hot liquids can burn user. To prevent spills and leaking, the lid needs to be properly and fully tightened to ensure airtight seal. S’well products are not intended for the long-term storage of liquids. Alcohol, some juices, and dairy-based beverages can spoil and may cause excessive pressure buildup in your bottle, which can lead to lid failure and injury. If you are using your S’well to enjoy a fizzy soda, some bubbly, or another carbonated beverage, please use caution when opening. The airtight seal maintains the pressure required for all those bubbles. However, we don’t want you to spray some champagne on your favorite jacket or have the cap get away from you. If using with carbonated beverages, never point the bottle at anyone when opening. S’well Tumblers, even paired with our lid, are not enclosed and may spill if not handled with care. Hot beverages can cause serious injury if spilled on user, so remember to exercise caution when using this product. Misuse of the S’well Roamer and its handle may result in injury, as well as cause premature wear and tear of the beverage container. Misuse of the Swing Cap and its handle may result in injury, as well as cause premature wear and tear of the bottle. Q: How does S’well personalization work? We’re so excited to offer personalization as a way to make your S’well all your own. By visiting the Personalization Shop on our website, you can specify the name, initials, or word of your choice and it will be engraved on your S’well bottle by our decorators. 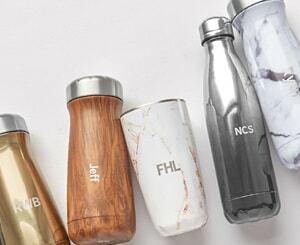 This engraving option is available for select S’well Bottle styles and sizes. We do not offer color or printed personalization at this time. See our Personalization page for more information and to place a personalized order. Please read our Policies for more restrictions. For most countries, you can expect delivery in 8–11 business days from the time your order is placed (including a 1-3 day processing period), this may vary depending on your country’s customs requirements. **Peak Season Notice: Orders containing personalized items may experience a slower processing time and ship within up to 72 hours of receipt. Q: How much does personalization cost? All personalization costs $10. This cost will be added to the original listed price of the S’well product. Q: Is there a character limit for personalization? We currently have three personalization options available, each with a different character limit. If you choose to engrave a name, there is a 10 character limit. For initials, there is a 3 character limit. Q: Can I add an Emoji or special character? Special characters are limited to the following lower case letters: à, â, ä, é, è, ê, ë, ì, ï, î, ò, ô, ö, ù, ç, and ñ.
Q: How will the personalization be displayed? If you choose our Name option, it will be engraved vertically on the bottle. If you choose Initials, it will be engraved horizontally. The text will be centered on the bottle on the opposite side from our S’well logo. At this time it cannot be adjusted to any other location. Q: What S’well styles and sizes can be personalized? Please see the full list of styles and sizes available here. Q: Can I choose the font I want to engrave with? Our personalization is done in our custom S’well font, designed specifically for a clean look that works nicely with our bottle design. We do not offer other font options at this time. Q: Can I return/exchange a personalized bottle? All personalized bottles are Final Sale. We will not accept returns or exchanges. Q: What is a S’well Gift bag? Our S’well Gift Bag is a perfect solution for concealing your recipient’s S’well surprises. The 100% cotton pouch comes in a variety of sizes to fit all our bottles, including S’ip bottles and our new S’well Roamers. Q: What bottle fits in each size? What are the Dimensions of your gift bags? Q: Will my bottle come gift wrapped? No, we wanted to make sure you can personalize your gift before it gets to your recipient. Q: Does the gift bag come with a “to/from” hang tag? Yes, allowing you to let your recipient know who sent them their awesome S’well bottle. Q: Can my gift bag be embroidered? Currently, we do not have an embroidering feature. Q: Do I have to order a bottle to order a bag? No, our gift bags are available on the accessories page. Q: Can I reuse my S’well gift bag? Yes, we recommend it! The ways in which you repurpose your gift bag is only limited by your creativity! Q: Are there different colors? At this time, we are only offering our blue gift bag. Q: My gift bag is damaged, what can I do? S’well will cover replacements for any gift bags that arrive damaged. Q: What is the character limit for gift messages? 300 characters. Please no special characters or emojis, stick to English characters. Please read our Policies for more restrictions. Q: Is there an additional fee for gift messages? Q: Can I edit my gift message? Once you have submitted your order, we will not be able to edit your gift message. Q: Where will my gift message appear? Your gift message will be located on the bottom of the S’well packing slip. Q: What are S'well's promotional exclusions? S’well may offer promotional codes and special offers that apply to online orders from swellbottle.com. Any discounts and/or special offers will be applied to your order upon checkout. Limit one (1) discount code per purchase. Not valid on prior purchase. Not valid for the payment of taxes and/or shipping fees. Gifts with purchase are not eligible for refunds or exchanges. Promotions and special offers have no cash value and cannot be sold, transferred or assigned. Void where prohibited, taxed or restricted by law. S’well has the right to end or modify any promotion or special offer and it’s redemption period at any time without notice. S’well reserves the right to cancel and refund orders that violate any of the restrictions listed above. Q: Is S’well currently offering any promotions? Not at this time! Subscribe to our newsletter for new product releases and promotions! Q: Is S’well offering any discounts? S’well offers discounts on select styles available in our Goodbye Party Sale. S’well is offering discounts to students (18 years or older) who are attending an American university or college with a valid student email address. You can access this discount by visiting the Student Store. Subscribe to our newsletter to stay up-to-date on news, discounts, and promotions. Q: How do I access the Student Store & student discount? After creating an account using a valid “.edu” email address, you can access the Student Store from the menu or by clicking on the link at the bottom of our website. You may also access it by clicking here. Q: How much is the discount for the Student Store? What bottles are discounted? You can save up to 20% off select styles in the Student Store at swellbottle.com. Styles are subject to change, so keep an eye on our page for updates. Only available online at www.swellbottle.com. Q: Can I use another promo code on top of the student code? The student discount cannot be combined with other promo codes or offers. Q: I already have an account. How can I add my student email address? Not to worry. You can create a new account, or reach out to our Customer Service team so they can change your account settings. Q: My discount isn’t working. Why can’t I access the Student Store? If you’re still having trouble, reach out to us. Customer Service is here to help! Q: Are there any discount restrictions? Q: What is the warranty on S’well products? S’well offers a one-year limited warranty on all bottles purchased from swellbottle.com and authorized retailers with proof of purchase. For more information regarding authorized retailers please visit our authenticity page. This warranty covers any manufacturer defects, such as thermal performance issues, base becoming detached from the bottle and non-polished surfaces. To report a claim, please send an email to help@swellbottle.com with proof of purchase, reason for claim and pictures of your bottle. Specifically, please send a full-length photo of the front of the bottle, the bottom of the bottle and the claimed damage or defect area, if applicable. S’well reserves the right to request the product to be sent to our office for additional review and to verify the claim. All shipping labels will be provided by S’well. S’well will review all cases. In the event that S’well deems a replacement is necessary, we will replace the product with the same style and size. If that product is not available, the closest style will be sent as a replacement. S’well’s one-year limited warranty does not cover any issues due to improper use, normal wear and tear, or loss / theft of the bottle. Q: What is the warranty and return policy on S’well Swarovski products? For questions or concerns regarding warranty and return information for our Swarovski bottles, please email help@swellbottle.com. Submit a request and our S'well Bottle Experts will answer your request within 24 hours. For time sensitive issues, please contact us at (844) 60- SWELL Monday through Friday between the hours of 9AM and 7PM EST. Please note, if you are trying to get in touch with our Marketing or Communications teams, please click here to submit a request for contact.